October belongs to ghosts, goblins and other creepy things. Thankfully, dethatching your lawn is almost frighteningly easy. Thatch will provide a nice cushion for lawn foot traffic (such as trick-or-treaters!) but when the layer becomes too thick, it can lead to insect infestation, grass disease, poor root growth and low nutrient intake. Thatch is a loose layer of living and dead shoots, stems and roots that can compile between the grass and the soil surface. This can happen when your lawn produces organic debris faster than it can be broken down. Ideally, you want the thatch layer to be less than ½ inch thick. A layer this size acts as a makeshift blanket for the soil, moderating extreme temperatures and moisture levels, limiting weed growth and providing a cushion for foot traffic (something you want when trick-or-treaters take shortcuts across your lawn!). But too much thatch can cause you much toil and trouble, including insect infestation, disease, inability of the grass’ roots to grow deeply, and blocking the soil from getting water and nutrients. Just remove a four-to-six-inch plug of turf and measure the thatch layer. If the layer more than ½ inch thick, it’s time to dethatch. 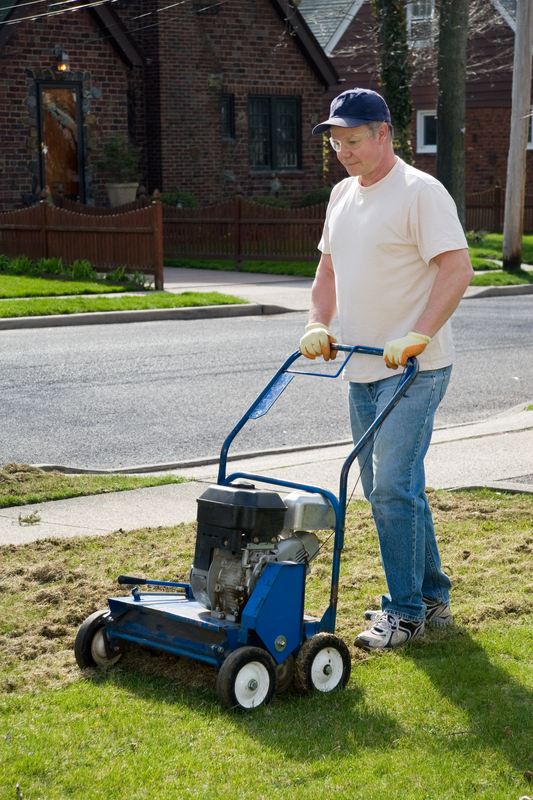 Consider renting a power rake to dethatch your lawn when working in a small area. If the area you’re working with is small, consider using a power rake. Otherwise, a rented vertical mower will work well for the average-sized lawn. These machines have blades that are perpendicular to the grass surface and rotate to bring up the organic debris. Be careful not to remove too much of the thatch layer. Set the blades high at first to take only a little off the top. This way you can assess how much thatch you have left without worrying about cutting it too short. For cool-season grasses, pick a cool, dry autumn day to dethatch; the cooler temperatures reduce the chance of serious turf injury. As you remove thatch, you may also remove live turfgrass plants; simply overseed your lawn after dethatching should this happen. Aerate your lawn regularly. Core aeration helps by physically remove thatch. More importantly, it improves air movement into soil by breaking up compaction. This increases microbial activity and thatch breakdown. Use lawn chemicals cautiously. Too much fertilizer can cause thatch to grow more rapidly as well as your grass. Only use fungicides and pesticides when you needed. Using chemicals frugally will also help keep earthworms around. This is important because when earthworms burrow, they mix soil and castings with thatch. That helps stimulate microbial activity and breakdown of thatch. Test the soil’s pH. You may need lime to raise pH levels to support good turf growth and microbial populations for thatch breakdown. Soil test kits are available inexpensively at your local home and garden store. 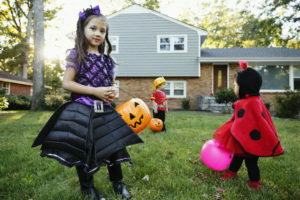 With a little attention (and a couple of passes with the mower), your lawn’s thatch level will once again nurture the soil and roots underneath while handling all the costumed traffic that Halloween brings!